In summer 2009, Shane Bauer, Josh Fattal, and Sarah Shourd were hiking in the mountains of Iraqi Kurdistan when they unknowingly crossed into Iran and were captured by a border patrol. Wrongly accused of espionage, the three Americans ultimately found themselves in Tehran’s infamous Evin Prison, where activists and protesters from the Green Movement were still being confined and tortured. Cut off from the world and trapped in a legal black hole, Bauer, Fattal, and Shourd discovered that pooling their strength of will and relying on one another was the only way they could survive. In A Sliver of Light, the three finally tell their side of the story. 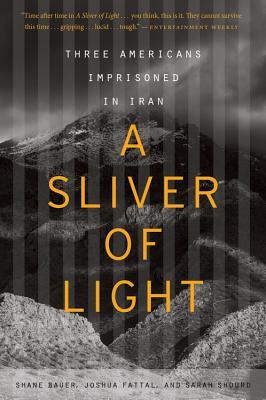 They offer a rare glimpse inside Iran at a time when understanding this fractured state has never been more important. But beyond that, this memoir is a profoundly humane account of defiance, hope, and the elemental power of friendship. SARAH SHOURD is a writer, educator and Contributing Editor at Solitary Watch currently based in Oakland, California. Sarah has done international human rights work with the Zapatista indigenous movement in Chiapas, Mexico; organized with women’s groups against unsolved murders of sweatshop workers in Juarez, Mexico; and taught for the Iraqi Student Project while living in Damascus, Syria. After her wrongful imprisonment in Iran, Sarah has become an advocate for prisoners' rights, focusing her writing, speaking, and theater projects on the wide-spread use of prolonged solitary confinement in U.S. prisons and jails. She has written for the New York Times, San Francisco Chronicle, CNN, and Newsweek/Daily Beast, and contributes a blog to Huffington Post.